A queen(Tejaswi Prakash) like figure sit in royal chair with royal look; she had epee in her hand which she handle like walking stick; her eyes show so much anger. Those men’s tongue stick to the palate; their heart beats fast; they were sweating profusely. She starts speaking; but it more like roaring. She tells,”I never let people with bad intention to enter into my palace.” She rolls and next second near to them; she points her epee towards them. Both try to move backwards, but can’t. By saying that, she evaporates like air and royal chair move backward into house like the speed of light. Both men frightened and faints. Sanskar house is shown with decorating. A lady is moving here and there tensedly. So many people were decorating the house. Their house shows glitter effect. Mansi (Shafaq Naaz) is Sanskar family’s care taker’s daughter but more like his sister. From her childhood she is with Sanskar family. After her Parents death, Sanskar’s Parents take care of her as their own daughter. She is a widow. So many times Sanskar told her to marry other. But she refused. She won’t take part in any rituals, because she is widow. She is a girl who thinks widow is inauspicious. So, many times Sanskar tried to make her participate in rituals but she is reluctant. That’s why she didn’t go to shopping also. Mansi, ” Sanskar, what are you doing here? Go and get ready. Today is your Haldi.” Sanskar knows whatever he says she won’t hear it, so he went upstairs. Calling bell rings, Mansi told event manager to welcome them and she went to her room. Janaki, “You should not meet him now. First you go and change your dress.” Ragini went to change her dress. SwaLak brings Mansi. Janaki, “Mansi beta, you should present in your brother’s rituals.” Mansi, ma that how i?” Sujatha, ” see dear, for Sanskar you are only there, if you also not with him, he will feel lonely.” They blackmiled her emotionally. With half heart she agrees to be there. But with a condition that she won’t do any ritual. Swara brings Ragini and Laksh brings Sanskar. Ragini wears simple white Salwar, Sanskar wears simple white kurta. Both move towards eachother without taking their eyes off. Finally their wish come infront of them. Both are so…so happy. They stand like a statue and both look deep into each other’s eyes. 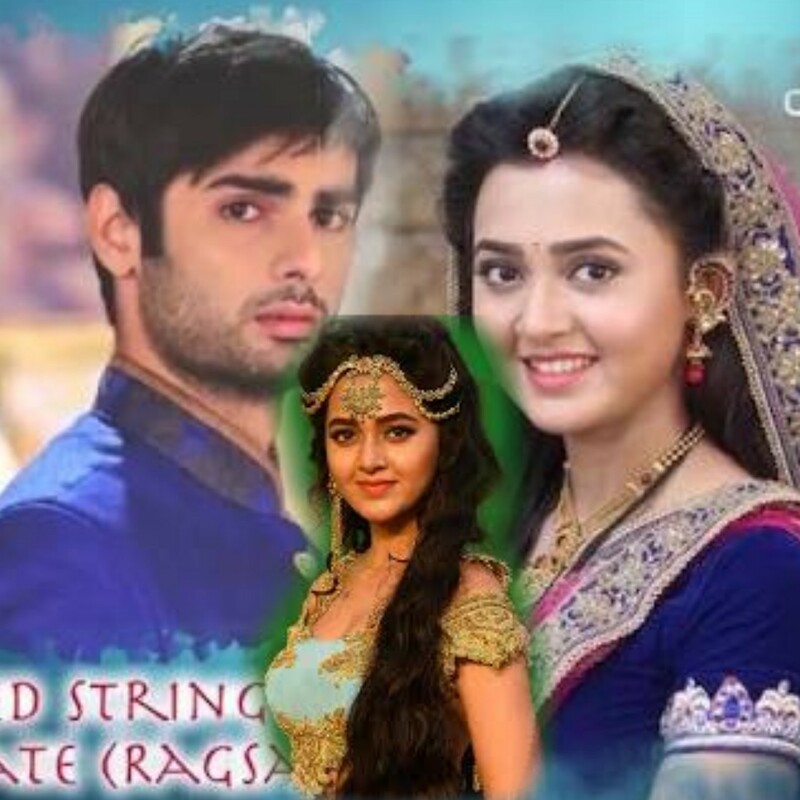 Swara hisses in Ragini’s ear, “this is not first night.” Ragini jerks,”don’t speak rubbishly, Swara.” Swara smirks,”everyone is waiting for you, but you people are wandering in another world.” Sanskar smiles and caresses his forehead with his thumb finger. Both sit in separate chair and Swalak put screen inbetween them. First, Janaki applies Haldi to them and wishes them. Next, Sujatha. One by one all applies. Sangini comes there but she is invisible to everyone. She went near to RagSan. She thinks, “This is the first time one daughter going to apply Haldi for her mumma and papa for their marriage.” She applies Haldi to both of them. Their heart beat increases in unknown happiness and they felt coldness in their body. Unknowingly tears fall from their eyes. Swara, “Mansi bhabi, you are only left.” Mansi,” Swara i told you na. I can’t do this.” Ragini,”leave her Swara, for calling her bhabi bhabi, she did lot to me. First she didn’t come for engagement, second for shopping, now also she is doing the same thing. She may thinks that i am not deserve for her love.” Mansi,” Ragini, it’s not like that. Sanskar, atleast you tell to her.” Sanskar,”she is right didi. Everyone from her side complete this ritual. But for me no one did this. After all i am orphan na.” Ragini and Sangini both felt sad at his words. Mansi hugs him,” i am always there for you Sanskar, why are you speaking like this?” Sanskar, “then do it for me” Mansi with shaking hands applies Haldi to RagSan. Sangini sees Mansi’s face and tells, “Chaachi.” Mansi turns to Sangini’s side. Laksh, “what happened didi?” Mansi,”nothing, i felt like someone called me”. SwaLak, “everyone completed na. Now it’s our turn.” Both move towards RagSan with hands full of Haldi. RagSan shook their head as no. Both try to get up, before to that SwaLak applies Haldi all over their face and dresses. Both giggles while RagSan fumes. All are laughing at them. Another side, Sangini thinking about her past. Palace is shown with Royal look. It’s fully lighted with earth lamp. It glitters even more in moon light. In terrace, a 7 years old girl, who dresses like princess running here and there. 27 years old lady (Shafaq Naaz) who also looks like royal princess, with rice bowl in her hand running behind her. Girl, “No chaachi, i don’t want”. Her Chaachi, “See my Princess, Sanskar papa and Ragini papa will be angry with me. For not make you eat.” Girl stops and look towards sky. Her chaachi holds her and feeds her. Girl, “chaachi, now mumma and papa will not be angry with you na.” She,”you yourself ask to them.” Girl look at moon and asks,” Mumma papa, you won’t be angry with Chaachi na. I had food. See my belly it’s swelling now.” After 2 minutes she turn to her chaachi, ” they told Sangini baby is good girl in this world.” She, “ofcourse, my Sangini baby is too good girl.” She takes her in her arms. Sangini looks at Mansi with tears. Sanskar and Ragini went to wash their clothes. Both went to guest room. Sanskar holds Ragini’s hand and pull her towards him and hold her waist. Sanskar,”you are looking so beautiful with this Haldi.” Ragini blushes. Sanskar,”from when you know blushing and all?” Ragini beats him playfully. I am ending this chapter here friends. Hope you all will like this Chapter. Please bear my grammatical mistakes.